Click the button below to add the Eager to Be by Schulick to your wish list. Description: This one's a rock song for two guitars... We frequently end our concerts with this one, because we really love strumming the hell out of our guitars in the last section! Threefifty is a Brooklyn-based band comprised of guitarists Brett Parnell and Geremy Schulick, whose instrumental compositions combine influences ranging from indie-rock, minimalism, and Baroque music. 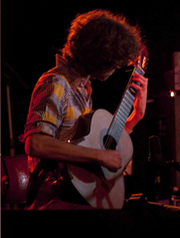 Threefifty originated as a classical guitar duo while Brett and Geremy were studying the instrument at The Yale School of Music, though gradually the duo took to writing all of their own material, incorporating nylon and steel-string acoustic guitars with the expansive palette of electric guitar and effects pedals. Some performance highlights include The NY Guitar Festival, Le Poisson Rouge, SXSW, TEDx Carnegie Mellon University, The 92nd Street Y, Austria's Schlossatelier, CMEAS' Fall UK Tour, and Sarajevo's Dom Armije. Recent projects have also included a collaboration with video artist Jennifer Stock. Threefifty's third studio album, "Collapses," is due out in early 2013. Threefifty is proud to be part of the D'Addario artist family.